Saturday 1st March, Royal Grammer School, High Wycombe. The quickest way to secure your ticket is call the credit card hotline between 9am and 5pm Monday to Friday. 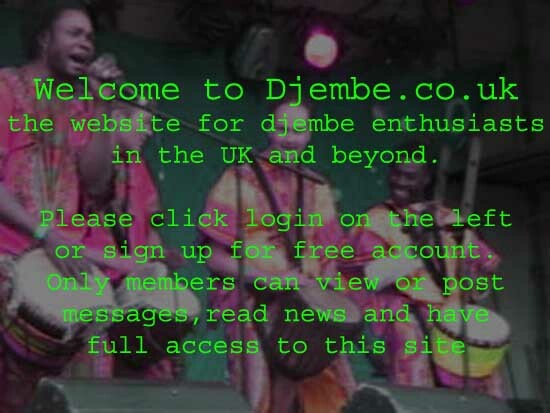 You can also download an application form from www.winterdrum.co.uk. and send a with a cheque to the address provided. Whether you are a drummer, percussionist, singer or dancer you'll find a lot to keep you entertained during the day with a great selection of workshops to attend. As well as the workshops the ticket price includes a 3 hour drum and percussion extravaganza in the evening. You could be performing on stage with your workshop group if you are up for it! If you can't make it during the day for the workshops you can attend just the Evening Show. Through-out the day top quality catering will be provided in the caf� in a friendly and festival style atmosphere. There will be a range of stalls selling a range of music and percussion products and Sapphire Moon - Fair Trade Stall. For the evening concert a bar will be available.